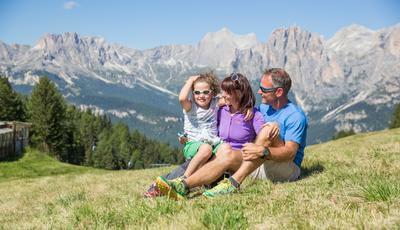 You are not simply reserving a room, but also a wonderful holiday in the Dolomites with many all inclusive services! Substantial breakfast buffet from 7.30 to 10.00 a.m. with various types of bread, pie and cake, marmalade, preserved meats and local cheese, yogurts, eggs, fruits, juice and more. Delicious afternoon buffet from 3:00 p.m. to 5:00 p.m with appetizers, pizza, cheeses, salt snacks, fruits and homemade cakes. 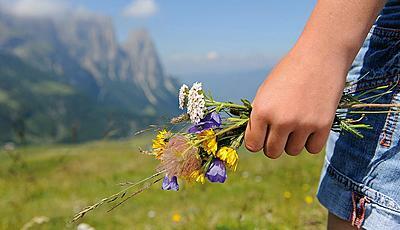 Dinner with menu choice: gourmet menu, wellness dishes, special local dishes from Trentino and baby menu. Salads, vegetables and cheeses from our buffet. Self-service drinks included at all meals: soft drinks, water and natural mineral. Individually arranged menus on request (vegetarian, diet, allergy). Delicious afternoon buffet from 2:00 p.m. to 5:30 p.m with appetizers, pizza, cheeses, salt snacks, fruits and homemade cakes. Indoor pool area with main pool (31°), outdoor pool (34°) accessible all year long and endowed with whirlpoos and other water attractions, baby pool (35°) with water slide, bio sauna for families, nearby garden. Access to the fabulous realm of the Ondina beauty & wellness centre: Turkish bath with menthol steam, panoramic Finnish sauna, sauna with herbs from Trentino, whirlpool grotte (36°), Kneipp therapy, “Salounge” with Himalayan sea crystals, exclusive relaxation areas with heated water beds, rocking armchairs lounge, recliner chairs and canopy beds, special showers and icefall. Infusions and fresh fruit in the wellness oasis. Fitness room with modern Technogym equipment. Private park, garden with biological bathing lake and playground. Vitality Wellness Programme: water aerobics and morning gymnastics. 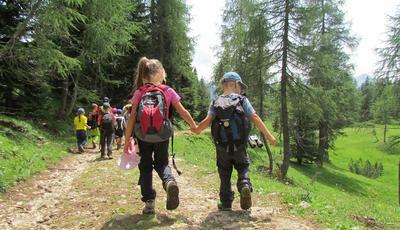 Programme of wonderful excursions, Nordic walking in the spring, summer and autumn. Hiking in the snow and snowshoeing in the winter. Free rental of mountain bikes (with deposit). Exclusive bathrooms with toiletries, hairdryer and vanity mirror. Soft bathrobes and slippers for adults and for children starting from 6 years, towels for the swimming pool. Free internet-access in the hotel with your personal laptop or PDA through wireless connection. Ski and walking maps at the reception. Library, wide choice of newspapers, reading room, bar, TV room, free internet point, panoramic terraces. Ski room with ski and ski boots lockers. Ski bus stops in front of the hotel in the winter. Spacious outdoor private parking (for free) and indoor garage at disposal with an extra charge of 5,00 € per night (free for the Suites).